Representatives of three inductees and one new member of the Times-Gazette Highland County Athletic Hall of Fame are pictured, from left, Mike Hull representing his daughter, Sarah (Hull) Marietta; Cindy Moberly, representing her late husband Glenn Moberly; Jenny Blair, representing her late brother T.J. Turner; and Danny Long. 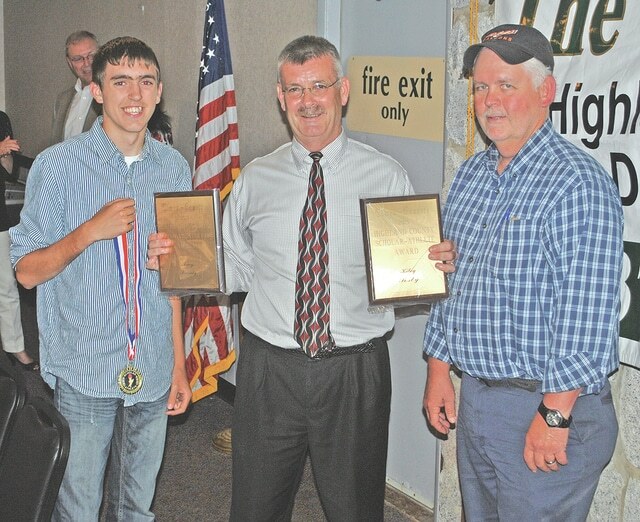 The Times-Gazette 2015 Highland County Scholar-Athlete Award went to Trey Moberly, being represented on the left by his cousin, Hunter Morgan; and Kiley Sosby, being represented on the right by her father, Greg Sosby. Also pictured is The Times-Gazette’s Jeff Gilliland. Four new members were inducted into the Highland County Athletic Hall of Fame and two seniors split the Highland County Scholar-Athlete Award when The Times-Gazette held its sixth annual sports banquet Wednesday. The new hall of fame inductees are Sarah (Hull) Marietta, Danny Long, Glenn Moberly and T.J. Turner. Mike Hull, accepting the award for his daughter, Sarah, a 2003 McClain High School graduate, talked about her desire to excel at basketball from the first time she touched a ball. He said that if she saw other girls do something on the basketball floor that she couldn’t do, she worked at until she was better. Mike said that early on Sarah went to tryouts for the Dayton Lady Hoopstars, who she went to win four national AAU championships with. He said the other girls were doing drills Sarah had never saw and she couldn’t quite keep up. So she went home and practiced and a week later the team’s coach asked Sarah to demonstrate to the other girls how they should be done. Hull went on to become McClain’s all-time leading girls scorer with 1,670 points and then played for Miami University, starting 38 games and scoring 466 points before her seventh knee surgery ended her playing career. Long, a 1964 graduate of McClain High School, talked about how many neat kids he’s come in contact with during his 25 years of coaching both swimming and golf at McClain, and his 50 years as a swimming official and 45 years as track official. Long, still a swimming and track official, said it has been a privilege to be able to work with so many young people for so long. The award for Glenn Moberly, who passed away in 2010, was accepted by his wife, Cindy. His youngest son, Jason, read an acceptance speech wrote by Glenn’s oldest son, JR.
Jason said Glenn often said that his lone daughter (he has a third son named Jamie), Jeanna Morgan, was the meanest and toughest of the kids. A 1959 graduate of Buford High School, Glenn coached and taught primarily at Lynchburg-Clay, where he was athletic director for 10 years and coached 11 sports, but also coached and taught at Jefferson High School in Blue Creek and Whiteoak High School in a career than ran from 1965-97. He was also a basketball official and helped with many other youth programs. Jason said Glenn loved telling stories, but rarely about himself. Jason said his dad later played the same trick on one of his own players. Jenny Blair accepted the award for her brother, T.J. Turner, a 1997 Hillsboro High School graduate who went on to become an All-Big Ten Conference linebacker at Michigan State University and played for the New England Patriots in the National Football League. Blair mostly thanked those who stuck by her brother through times good and bad, mentioning specifically C.J. Captain, Cameron Williams and the Ernie Blankenship family. She said Turner, who passed in March of 2014 at the age of 35, worked hard for everything he accomplished and would have been proud to accept the hall of fame award. She also threw some jokes toward the Hull family. Blair played high school basketball against Sarah Hull and they have remained friends through Facebook. Blair said she always tells Sarah that she was the better player of the two. Thirty-three scholar-athletes, who were nominated by their coaches and had to have a 3.0 grade point average and have lettered in at least one sport their senior year, were also invited to the banquet. Twenty-three of them were able to attend and collect their awards before the night was capped by the awarding of the 2015 Times-Gazette Scholar-Athlete Award. There were so many worthy candidates that The Times-Gazette decided to split the award. It went to Trey Moberly, a Hillsboro High School graduate and the grandson of Glenn Moberly, and Kiley Sosby from Whiteoak High School.